﻿ What is Mode Conditioning Patch Cables? 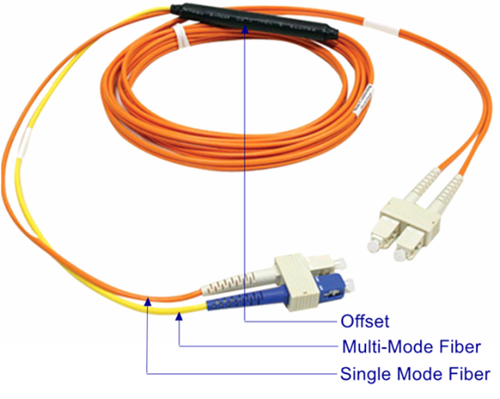 Mode Conditioning Patch Cables (MCP) is a duplex multi mode patch cord that has a small length of single-mode fiber cable at the start of the transmission leg including a single mode to multi-mode offset fiber connection part. Mode Conditioning Patch Cables are assembled with connectors using 62.5/125um or 50/125um fiber. The calibrated offset reduces phenomena called differential mode dispersion, or DMD, which can cause the transmitting laser pulse to spread out and merge into neighboring pulses creating bit errors in the transmission signal. DMD can cause a multimode fiber with a laser source to have a lower bandwidth than the same fiber with a LED source. The way to control DMD is to find a way of steering the injected laser light around the “dip”. That is the function and purpose of a Mode Conditioning Patchcord. Mode conditioners are built in the form of a simple duplex patch cable, so they can easily be installed in a system without the need for additional components or hardware. Their length can range from one meter and up to support virtually any network topography. When you need to connect the Gigabit-LX or a 10-Gigabit LRM transceiver optics with existing multimode fibers, you need this MCP cables installed at both ends of the network link. The commonly used Mode Conditioning Patch Cables (MCP) cables including LC to LC, LC to SC, LC to ST, LC to FC, SC to SC, ST to ST connectors with OM1/OM2/OM3 fiber cables. What can Transceiver Optics be used with MCP cables?